HIV-1–specific CTL responses play a key role in limiting viral replication. CTL responses are sensitive to viral escape mutations, which influence recognition of the virus. Although CTLs have been shown to recognize epitope variants, the extent of this cross-reactivity has not been quantitatively investigated in a genetically diverse cohort of HIV-1–infected patients. Using a novel bioinformatic binding prediction method, we aimed to explain the pattern of epitope-specific CTL responses based on the patients’ HLA genotype and autologous virus sequence quantitatively. Sequences covering predicted and tested HLA class I-restricted epitopes (peptides) within the HIV-Gag, Pol, and Nef regions were obtained from 26 study subjects resulting in 1492 patient-specific peptide pairs. Epitopes that were recognized in ELISPOT assays were found to be significantly more similar to the autologous virus than those that did not elicit a response. A single substitution in the presented epitope decreased the chance of a CTL response by 40%. The impact of sequence similarity on cross-recognition was confirmed by testing immune responses against multiple variants of six selected epitopes. Substitutions at central positions in the epitope were particularly likely to result in abrogation of recognition. In summary, the presented data demonstrate a highly restricted promiscuity of HIV-1–specific CTL in the recognition of variant epitopes. In addition, our results illustrate that bioinformatic prediction methods are useful to study the complex pattern of CTL responses exhibited by an HIV-1–infected patient cohort and for identification of optimal targets for novel therapeutic or vaccine approaches. Virus-specific CTL responses are considered to play a critical role in the containment of HIV-1 virus replication during primary (1–3) as well as chronic (4, 5) infection. The high mutation rate of HIV-1 results in selection of viral variants carrying immunological escape mutations. As variant epitopes emerge, the immune system develops T cell responses against novel and mutated epitopes, which is a process that continues beyond the first years of infection (6–9). In addition, some T cells cross-recognize variant epitopes more or less efficiently, and many are mere reminiscence of immune responses directed against preceding viral variants. Escape mutations prohibit the immune system from clearing the infection and have proven to be a major obstacle in vaccine development (10, 11). In summary, our ability to interpret the efficacy of observed immune responses has been hampered by the lack of understanding the interactions between viral variants and the genetic diversity of the human immune system (i.e., the multitude of HLA alleles and the diversity of the TCR repertoire). The HLA class I alleles are highly polymorphic providing a remarkable diversity of HLA molecules with distinct binding specificities. Even a small number of amino acid changes in the peptide binding groove of an HLA class I molecule may have a major impact on the peptide binding repertoire of the molecule and may even affect the rate of disease progression in HIV-1 (reviewed in Ref. 12). Epitopes binding to HLA class I molecules have to conform to the amino acid preference at the anchor positions of the HLA molecule. In parity with HLA diversity, amino acid substitutions within the epitope generally contribute to structural changes, impacting recognition by the TCR. The TCR is known to be promiscuous to some extent. The flexibility of the TCR in the recognition of epitope variants has been demonstrated with certain HLA class I alleles (13–16). Other studies reported that substitutions in immunodominant epitopes might revoke CTL recognition (4, 17), impair the generation of epitope-specific CTL responses (18), or generate a new subset of variant-specific CTL responses, which may exhibit an altered functional profile (8, 19). Variations of epitopes restricted by the same HLA class I allele are not equally efficiently cross-recognized (20), which seems to be linked to the flexibility of the dominant TCR recognizing the epitope (20, 21). Thus, a number of studies have presented qualitative examples of cross-reactivity, but its determinants have not been quantitatively analyzed in a genetically diverse patient cohort. The recent advances in the development of prediction tools for the characterization of HLA class I binding specificities and the ability to obtain large datasets made up of information concerning the virus and host genotypes have made it possible to evaluate some of the HLA:epitope:TCR interactions with novel bioinformatic techniques. In a cohort of patients with diverse ethnic backgrounds, we recently tested the immunogenicity of a set of 184 variant potential CTL epitopes, selected by the EpiSelect algorithm to cover a maximum number of different HIV-1 subtypes. Taken together, immune responses against the majority of the peptides were detected in 96% of the study subjects (22), indicating the usefulness of this set of epitopes to identify and characterize immune responses in a genetically diverse population infected with different HIV-1 subtypes. In the current study, we obtained the autologous viral sequences of the HIV-Gag, Pol, and Nef regions, covering 60 of the 184 tested peptides, to quantify how genetic variation within the potential epitopes influences the ability of the CTL to recognize them. As high-resolution HLA-genotyping had been obtained, this allowed us to take into account the ability of peptide variants to bind to the patients’ HLA-A and -B molecules using the prediction method NetMHCpan (23) and to analyze the response patterns observed in this dataset. In benchmark studies, NetMHCpan has been demonstrated to accurately predict the peptide binding affinity even for HLA molecules whose binding specificity has not been experimentally characterized (24, 25). This makes the method suitable for application to our ethnically diverse patient cohort and enabled us to quantify the determinants of TCR cross-recognition across HIV-1 subtypes. To confirm our findings, we reanalyzed responses (directly ex vivo) against six autologous epitopes and variants, introducing commonly found amino acid and alanine (Ala) substitutions in positions P2–P9 of the epitope. By combining virological data in form of viral sequences, genetic data in the form of HLA genotype, and immunological data in the form of immune responses against HIV epitopes, we shed light on the determinants of TCR promiscuity. This study was approved by the Regional Ethical Council (Stockholm, Sweden [2005/1162]), and all subjects provided written informed consent. The study subjects, 12 men and 14 women infected with different HIV-1 subtypes and circulating recombinant forms, composed a genetically diverse population originating from 12 countries. Pérez et al. (22) tested and reported HIV-specific T cell responses against 184 predicted HLA class I-restricted epitopes identified using PBMCs by detection of IFN-γ production in the ELISPOT assay. These 184 potential epitopes were located within five of the HIV-1 proteins (Gag, Pol, Env, Nef, and Tat). Positive and negative immune responses were first identified by using 26 pools of peptides containing the 184 predicted epitopes in the ELISPOT assay. Second, the presence of HIV-specific immune responses was verified against 114 (62%) of the 184 tested epitopes, using individual peptides in the ELISPOT assay. For 24 patients, high-resolution HLA typing was obtained for the HLA loci A and B (22, 26). For one patient (patient code 2866), only low-resolution typing was available for loci A and B. The alleles of this patient were inferred to be A*0201, A*2402, B*0702, and B*4402 based on the ethnicity of the patient (Caucasian) and the high frequency of these alleles in this ethnic group (27). For one patient (2264), it was only possible to determine the HLA-A alleles at low resolution, which were then inferred to be A*0201 and A*2402. Sequences were obtained for the p17 and p24 regions of gag, the complete protease and partial reverse transcriptase regions (nucleic acid positions 1–1968 relative to reference sequence HXB2) of pol, and the complete nef gene. These sequences covered 60 nonameric peptides of the 184 peptides that had been tested in ELISPOT assays. For 4 of 26 patients, only partial autologous sequences could be obtained. In total, our dataset comprised 1492 patient-peptide pairs (22 patient sequences covering 60 autologous 9-mer peptides and 4 patient sequences covering 32, 43, 48, and 49 peptides, respectively). Viral sequence data were generated using population-based sequencing from extracted viral RNA in plasma using the QIAamp MinElute Virus Spin kit (Qiagen, Solna, Sweden) in accordance with the protocol. From plasma samples with a low virus load (<10,000 copies/ml) virus was concentrated by ultracentrifugation of 1–2 ml plasma. The different HIV-1 regions were independently amplified using cDNA synthesis followed by a nested PCR using gene-specific primers (Supplemental Table I) as described previously (8, 22). The sequences were manually checked for base-calling errors and polymorphic sites using Sequencher 4.8 (Gene Codes, Ann Arbor, MI). The nucleotide sequences were subsequently translated to protein sequences with the help of the Gene Cutter tool offered by the HIV Sequence Database (www.hiv.lanl.gov/content/sequence/HIV/HIVTools.html). The sequences have been submitted to GenBank and received the following accession numbers: EU300947–EU300975 (HIV-Gag p17), GU324779–GU324805 (HIV-Gag 3′, aa 419–500 relative to protein start in HXB2), GU324806–GU324833 (HIV-Gag p24), GU324834–GU324859 (HIV-Nef), GU324860–GU324886 (HIV-Pol, aa 1–417 relative to protein start in HXB2), and GU324887–GU324915 (HIV-Pol, aa 429–656 relative to protein start in HXB2). All predictions of peptide binding affinities to HLA molecules were conducted using NetMHCpan-2.0 (23). Peptides were predicted as binders if their prediction score exceeded an HLA-specific threshold. For each HLA allele, this threshold was determined as the score that defined the top 1% binding fraction of a large set of random natural 9-mer peptides. Predictions were performed for all peptides that were tested for a patient (22) and for all of the patient’s HLA alleles. In addition, predictions were performed for all autologous peptides of a given patient that corresponded to the tested peptides. In cases of polymorphic autologous peptides, the mean prediction value over all possible peptide variants was assigned and used to determine whether a peptide was predicted to be restricted by one of the patient’s HLA alleles.
. In cases of polymorphic autologous peptides, the mean similarity over all possible peptide variants was assigned, unless one of the autologous peptide variants was identical to the tested peptide, in which case the similarity was set to 1.0. We selected nine individuals from the study cohort to investigate responses against six epitopes and epitope variants: Gag p24 HA9 (amino acid position 84–92), Gag p24 GI9 (position 127–135), Nef QY9 (position 73–81), Nef AK9 (position 84–92), Nef QY9 (position 107–115), and Pol RT SM9 (position 156–164). We restricted the selection to epitopes for which autologous and tested peptide sequence were identical and which were part of the set of broadly immunogenic epitopes recognized by at least four subjects in this cohort as defined by Pérez et al. (22). Common variants in positions P2–P9 of these epitopes (n = 21) were chosen after sequence analysis from the HIV Sequence Database (www.hiv.lanl.gov). Additionally, Ala substitutions for all six epitopes (n = 18) were included in epitope positions P4, P5, and P6 as commonly found variants were rare at these positions. All statistical tests were performed using R (www.R-project.org). Two-sided Mann-Whitney U test, χ2 test, and two-sided binomial proportions test were applied as appropriate. In this study, we aimed to explain the pattern of epitope-specific CD8+ T cell responses measured in an ethnically diverse cohort of HIV-1–infected patients based on the patients’ HLA genotype and autologous virus sequence. The large dataset allowed us to quantitatively evaluate how the number and location of mutations within a given epitope influenced the T cell response. In our approach, we integrated three sets of data: 1) ELISPOT responses for a set of epitopes that are hereafter referred to as tested peptides; 2) sequences of the patients’ autologous virus; and 3) bioinformatic binding-affinity predictions for the tested and autologous peptides and the patients’ HLA alleles. Additionally, we confirmed our results by measuring T cell responses against a selected set of broadly immunogenic epitopes and several commonly found epitope variants. By comparing the sequences of variant epitopes for responders and nonresponders, we gained new insights concerning sequence-dependent factors that define TCR cross-recognition. In total, we obtained the autologous sequences of up to 60 tested 9-mer peptides in each of the 26 patients studied (see Materials and Methods), resulting in 1492 patient-specific peptide pairs (a peptide pair consisting of the tested peptide sequence and the corresponding autologous sequence of a patient). In the previously reported IFN-γ ELISPOT assays (22), CTL responses were observed for 139 of these 1492 patient-peptide pairs, corresponding to 9.3% positive responses. All of the peptides included in this study elicited an immune response in at least one donor. We used the computational method NetMHCpan (23) to predict the binding affinity of each tested and autologous peptide to each of the patients’ HLA alleles. On the basis of the binding prediction and the observed CTL response, there are eight possible scenarios, which in turn can be classified as true-positive, true-negative, false-positive, or false-negative predictions. Table I explains these different scenarios and states the outcome for our dataset. The analysis presented in this paper focuses on tested and autologous peptide pairs that are predicted to be restricted by the same HLA allele expressed by a given donor (ascribed to scenario 1 and 2 in Table I). In doing so, we restrict our analysis to sequence variations within the peptide that specifically influence recognition by the TCR and exclude peptide variants unable to bind to the host HLA class I molecules. Scenario 1 is categorized as a true positive prediction as both the tested and autologous peptide are predicted to bind to one of the subject’s HLA alleles, and we detect a cellular immune response against the tested peptide. Scenario 2 is categorized as a false-positive prediction as both peptides are predicted to bind to the patient’s HLA, but we do not see an immune response. This set is likely to be biased by peptides that are actually presented to the TCR (in which case the binding prediction would be correct), but no CTL response is elicited because of immunodominance (30) or because the CTL that is specific for the autologous peptide does not cross-react with the tested peptide variant. This makes this set particularly interesting for further analysis. To unravel what distinguishes the peptides that are recognized by the TCR from those for which the CTL response is revoked (provided that it was raised in the first place), we compared the amino acid sequences of all the tested and autologous peptide pairs in terms of amino acid similarity (see Materials and Methods). By considering only those peptide pairs for which both the tested and the autologous peptide sequences were predicted to be restricted by the same HLA molecule expressed by the patient, we focused our analysis specifically on the differences intrinsic to peptides that are actually likely to be presented to the TCRs. In this situation, if there is a CD8+ T cell population that recognizes both the tested and the autologous peptide-HLA complex, the determinants for this cross-reactivity will be specific for the sequence differences between tested and autologous peptide because they are presented by the same HLA molecule. Comparing the amino acid sequence similarity between peptide pairs recognized by the patients’ HIV-specific T cells with the similarity of peptide pairs not recognized by the T cells resulted in a significant difference (p = 0.0003, Mann-Whitney U test) between these two groups (Fig. 1). Furthermore, we found that the T cells recognizing epitopes restricted by HLA-A and HLA-B alleles were equally sensitive to amino acid variations within the epitopes (data not shown). Similarity between tested and autologous peptides influences recognition. Comparison of peptides that induced a CTL response (responders) and those that did not induce a response (nonresponders) in terms of peptide similarity between tested and autologous peptide limiting the analysis to peptide-pairs that are predicted to bind to the same HLA molecule expressed by the patient. The majority of the tested peptides that were recognized by the subjects (54%) were identical to their autologous viral sequences. This was significantly higher than the fraction (31%) of peptides identical to the autologous sequence in the group of nonresponders (p = 0.002, binomial proportions test) (Fig. 2A). A smaller fraction (32%) of peptide pairs in the responders differed at one single position, and only 14% contained more than one amino acid substitution. Among the nonresponders, a large majority (69%) of the peptide pairs differed by at least one amino acid substitution, and the fraction of peptides containing two substitutions was significantly higher than for responders (25% compared with 8%; p = 0.01, binomial proportions test). Single substitutions in the tested peptide decrease the chance of a CTL response by half. A, Distribution of the number of substitutions between tested and autologous peptides for responders and nonresponders (limited to the set of predicted binders). B, Fraction of responders among the predicted binders that show zero, one, or multiple substitutions between tested and autologous peptides. Within the group of identical peptide pairs, a fraction of 34% was responders (Fig. 2B). This fraction dropped to 21% when there was one single amino acid substitution between tested and autologous peptide. This means that, in our cohort, one single substitution in the presented peptide reduced the chance of a CD8+ T cell response by 40%. Multiple substitutions further decreased the chance of recognition by 50%. Generally, an epitope does not elicit a CTL response in every patient carrying the restricting HLA allele. To investigate this phenomenon in our dataset, we calculated the fraction of responding patients among all patients carrying the restricting HLA allele for a given epitope and where tested and autologous peptide sequences were identical. This analysis was restricted to well-defined epitopes as defined by the HIV sequence database (www.hiv.lanl.gov/content/immunology/tables/optimal_ctl_summary.html). On average, only 50% of patients carrying the restricting HLA allele showed a CTL response against the given epitopes (see Table II). We investigated whether the observed amino acid substitutions were evenly distributed over all the positions in the peptide. Fig. 3 illustrates the distribution of single substitutions (Fig. 3A) and all substitutions (Fig. 3B). Interestingly, we observed no single substitutions at positions P4 and P5 for cross-recognized peptide pairs and only one at P6 (V→L). Also when considering multiple substitutions, these nonanchor positions showed the lowest fraction of substitutions among the responders, and all substitutions were conservative (F→Y, I→V, and V→L). For both responders and nonresponders, the highest fraction of substitutions was observed at position P3. Overall, taking all substitutions into account, the fraction of substitutions at P1 and the nonanchor positions P4 through P7 was higher for peptides that were not recognized as compared with peptides against which a response was detected (Fig. 3B). Note that in both cases the absolute number of substitutions is much higher for the group of nonresponders. For the peptide pairs of responders, we observed several amino acid substitutions at the anchor positions. These substitutions were unlikely to interfere with binding to the HLA molecule as all the analyzed peptide pairs were predicted to be binders. Mutations in positions P4–P6 of the epitope are rare in responders. Fraction of single substitutions (A) and any substitution (B) per epitope position. The fraction at a given position is calculated as the number of substitutions observed at that position divided by the total number of observed substitutions. The number of substitutions for each set is given in parentheses in the legends. To further investigate the influence of single and multiple substitutions on TCR cross-recognition, we selected six epitopes against which CTL responses were detected in at least four patients (defined as broadly immunogenic epitopes by Pérez et al. ) and which were identical to the responding patients’ autologous virus sequence. We identified common variants of these epitopes in the HIV Sequence Database (www.hiv.lanl.gov) and tested the CTL response against these epitope variants in those patients for which a response against the original epitope had been observed previously. As the number of naturally occurring substitutions at positions P4, P5, and P6 in these epitopes was remarkably low, we included variants containing single Ala substitutions at these positions into our experimental setup. The results of the ELISPOT assays are given in Tables III–VIII. Again, we only considered predicted HLA class I binders in our analysis. However, in this case, we used a less stringent cutoff than before (5% instead of 1%) because we were only considering donors who showed a CTL response against the reference epitope (which in each case was identical to the donor’s autologous epitope), which in turn implied presentation of the epitope by one of the patient’s HLA molecules. In addition, we considered embedded 8-mer peptides as potential epitopes in cases where the 9-mer was not compatible with the patient’s HLA genotype. These cases are indicated in Tables III–VIII. Taking the CTL response against the autologous epitope sequence as a reference, the relative magnitude of the CTL response against the epitope variants (fraction of spot-forming units [SFUs]) was directly correlated with the amino acid similarity between reference epitope and epitope variant (Pearson correlation coefficient = 0.47; p < 10−6) (Fig. 4A). 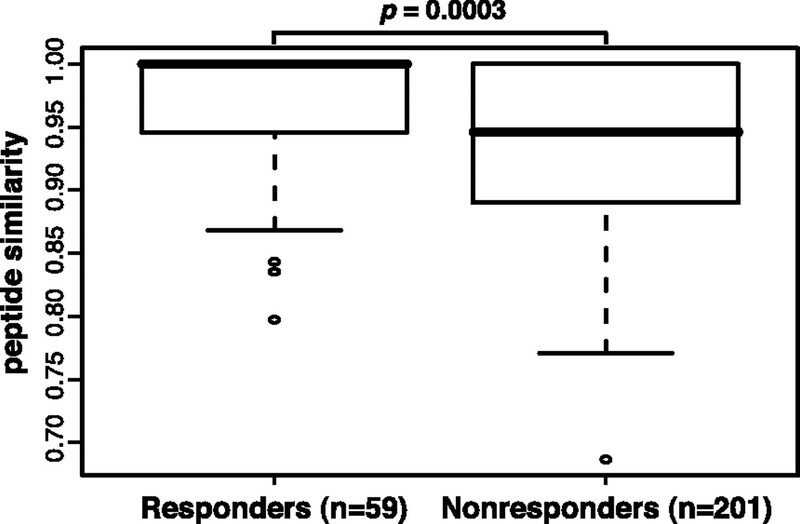 A single substitution reduced the magnitude of the response on average by 33% (p < 0.0001, Mann-Whitney U test), whereas multiple substitutions reduced the response by 80% (p < 10−6, Mann-Whitney U test) (Fig. 4B). The Ala substitutions showed an equally large impact on TCR cross-recognition for positions P4, P5, and P6 (Fig. 4C). Allover, 65% (31 of 48) of the single Ala substitutions abrogated recognition by the TCR while maintaining binding to the restricting HLA molecule. As had been observed also for the original ELISPOT dataset, the epitope variants that induced a CTL response showed a significantly higher amino acid similarity to the reference epitope than those variants that did not elicit a CTL response (p < 10−6, Mann-Whitney U test) (Fig. 4D). Analysis of the CTL response pattern against six variant epitopes. A, Pearson correlation between the CTL response against variant epitopes (given as the fraction of SFUs relative to the reference epitope; nonresponders were assigned a SFU value of 50) and the peptide similarity between epitope variant and reference epitope. Data points representing Ala substitutions are displayed as ●. B, Reduction in CTL response relative to the reference epitope for variants differing at one or more than one position, respectively. Epitopes containing Ala substitutions were excluded from this analysis. C, Reduction in CTL response against variants containing Ala substitutions at positions P4, P5, and P6 of the epitopes. 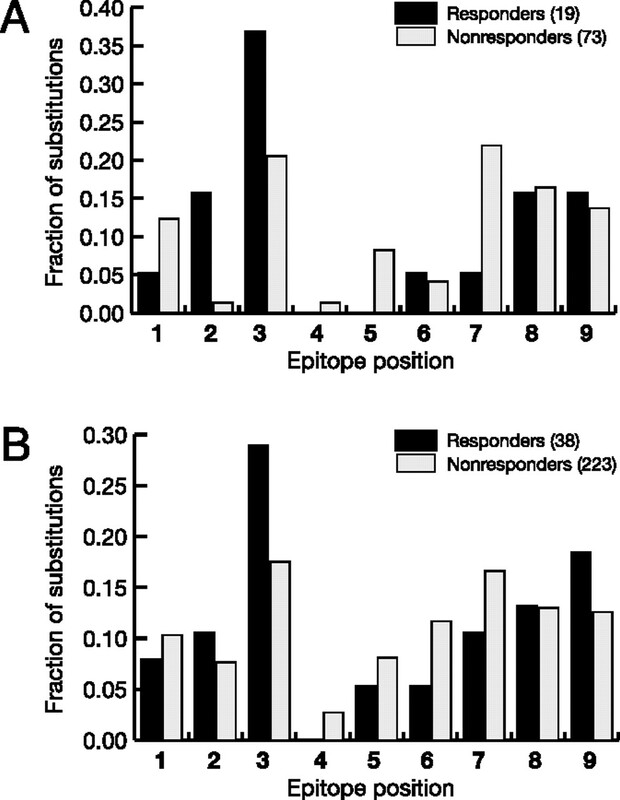 D, Comparison of epitope variants that induced a CTL response (responders) and those that did not induce a response (nonresponders) in terms of their peptide similarity to the corresponding reference epitope. In this study, we analyzed and explained the CTL response data obtained by testing a set of variant potential CTL epitopes in a cohort of HIV-1–infected individuals (22) by means of a bioinformatic prediction method for HLA class I peptide binding. The study comprised genetically diverse host and viral populations, including 26 subjects originating from 12 countries infected with several different HIV-1 subtypes and circulating recombinant forms. The knowledge of each patients’ HLA genotype and autologous virus sequence enabled us to compare peptides that are cross-recognized by epitope-specific CTLs with peptides that are not cross-recognized and to quantify these differences as a determinant of TCR promiscuity. The influence of single substitutions on TCR cross-recognition was confirmed by testing CD8+ T cell responses against autologous epitopes and commonly found epitope variants. Our study shows that a single mutation within an HLA-A– or HLA-B–restricted epitope significantly decreases the chance of recognition. Furthermore, we found that mutations located at positions influencing binding to the TCR of the HIV-specific CD8+ T cell were not well tolerated. Promiscuity of the TCR in the recognition of epitope variants in complex with certain HLA alleles (i.e., A*0201, A*1101, B*5301, and B*5701) has been demonstrated for limited sets of epitopes in a number of studies (13, 14, 16, 20). Other studies report the abrogation of TCR recognition by mutations within the epitope or in its flanking regions (4). HIV-specific responses directed against some but not all B*5701-restricted epitopes, an HLA allele associated with slow disease progression, have been shown to efficiently cross-recognize variant epitopes (20) or to develop strong responses to the arising variant epitopes (31), suggesting that several factors are influencing the level of cross-recognition. Yu et al. (15) observed cross-clade recognition of epitopes with considerable differences in their amino acid composition, suggesting that TCRs of HIV-1–specific cells can tolerate some degree of amino acid substitutions in their target epitopes without total loss of epitope recognition. Lee et al. (32) tested all single-substitution variants of the immunodominant HLA-A2–restricted HIV-Gag epitope SLFNTVATL (SFL9), of which only a third were recognized. Further analysis of this data revealed that TCR cross-recognition of SFL9 is driven by the biochemical similarity of epitope variants and that central epitope positions are most important for epitope-TCR binding (28). Thus, TCR cross-recognition is dependent on factors, such as the conformation of the HLA-peptide complex and the flexibility of the responding TCR clone(s). In our study, we excluded sequence variations predicted to influence the binding to the HLA class I allele and focused our investigation on the impact single and multiple substitutions within the epitopes had on recognition by the responding T cell population. Our results show that peptide pairs that are cross-recognized by CTLs share significantly more sequence similarity than peptide pairs for which no CTL response could be detected. This also holds true if we compare HLA-A–restricted and HLA-B–restricted peptide pairs separately, suggesting that there is no difference in the TCR cross-recognition of A-restricted and B-restricted epitopes. The nature of our dataset, comprising genetically diverse donors covering 42 HLA-A and -B alleles and seven different subtypes of HIV-1, did not allow us to draw conclusions based on individual HLA class I alleles or HIV-1 subtype differences, as has been shown previously by Geldmacher et al. (16). In our dataset, one substitution reduced the chance of a CTL response by 40% and further substitutions decreased the chance of recognition by another 50%. This observation supports the findings of McKinney et al. (14) who evaluated CTL recognition in five sets of variant HIV-1 epitopes restricted by HLA-A*0201 and A*1101 using HLA-transgenic mice and found that single amino acid changes were often tolerated by the TCR. However, we observed substantial differences in sensitivity to variation at different positions within the epitope. Amino acid substitutions seem to be best tolerated in P3, followed by substitutions in P2, P8, and P9 of the epitopes. In contrast, substitutions at positions P4, P5, and P6, which are presumably exposed to the TCR in the context of most HLA alleles (33, 34), were rare, and only conservative substitutions were tolerated. We confirmed these findings by measuring the CTL responses of a subset of patients against autologous epitopes and common variants of these. The impact of epitope sequence similarity on TCR cross-recognition was apparent as single substitutions significantly reduced the magnitude of the patients’ CTL response. In fact, the strength of the response directly correlated with the amino acid similarity between the tested peptide and the autologous viral sequence. The severe impact of variations within P4–P6 was emphasized by introducing Ala substitutions at these positions, because common variations were rarely found. 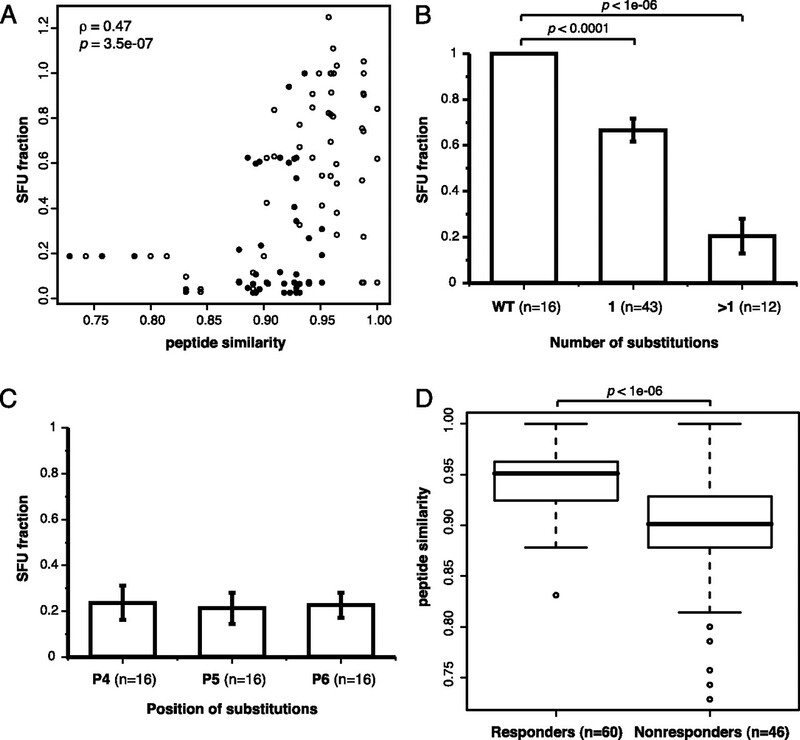 We show that the Ala substitutions abrogated responses equally by 65%. Likewise, epitope variants that elicited a CTL response showed a significantly higher similarity to the autologous epitope sequence than those variants for which no immune response was detected. Even though many amino acid substitutions within epitopes targeted by CTL will not abrogate the TCR recognition completely, our general finding suggests that even minor changes (i.e., introduction of similar amino acids) could be enough to reduce the strength of the response. Such partial escape from a CTL response might be favorable for the virus in conserved regions where mutations are critical for preservation of viral fitness. Taken together, our results show that HIV-specific T cell responses in general are sensitive to variations in positions targeted by the TCR. Among patients who possess a potentially restricting HLA allele and whose autologous peptides contain no substitutions, a CTL response was observed against 34% of the tested peptides. When limiting this analysis to a set of well-defined epitopes (hiv.lanl.gov), CTL responses were detected for half of the patients carrying a restricting allele. Thus, a large fraction of potential responses might fail to be raised because of immunodominance (30). This also agrees with our previous findings showing failure to raise immune responses against many well identified HLA-restricted epitopes in subjects carrying a particular HLA allele (8, 35). This analysis illustrates how immunodominance factors will place an upper limit on the success rate of epitope discovery projects. Likewise, responses that are actually due to recognition by CD4+ T cells add to the set of false negatives, because they were not anticipated on the grounds of MHC class I binding prediction. In general, however, we did not expect a high fraction of CD4+ T cell responses, because only nonamer and decamer epitopes were used in the ELISPOT assay, representing the optimal ligand size for HLA class I (36), whereas HLA class II molecules preferentially bind longer ligands (37–39). Responses were evaluated against a subset of HIV-1–derived peptides that were predicted to be potential epitopes, in contrast to screening the entire HIV-1 proteome for responses. This approach included variants of epitopes, which made it possible to study differences in the TCR recognition in a sequence-dependent manner. From the subjects, we obtained information on the autologous sequences using population-based sequencing. Even though the sequence was likely to be the most frequent variant found in a given patient, we have no guarantee that the immune response we measured was directed toward the virus sequence at hand. Despite these potential limitations, we were able to explain a large fraction (81%) of the observed CTL responses by applying the prediction method NetMHCpan (23) and by taking both the tested and autologous epitope sequences into account. Note that this high performance is mainly due to the large number of true-negative predictions (scenario 8 in Table I), whereas only 42% of the positive responses could be explained. Although the globally chosen prediction cutoff of 1% may not be adequate for all HLA alleles, giving rise to a considerable number of unexplained CTL responses (scenario 7), the presented results are robust to changes of this threshold. The main objective for introducing binding predictions as a filtering step was to discard data points when the absence of a CTL response was due to lack of peptide-HLA binding. The filtering step enabled us to focus the analysis on TCR cross-recognition by only including potential peptide-HLA binders. Additionally, unexplained CTL responses could be due to epitopes restricted to HLA-C. Various studies have linked HLA-C to HIV disease progression and convincingly implicated its importance to lower viral load (40–43). In our study, we did not include HLA-C predictions because of lack of information regarding the peptide binding repertoire for HLA-C molecules making predictions less reliable (23). Although other studies have focused on a limited set of HLA alleles and epitope variants, in this study, we demonstrate a more comprehensive picture of T cell recognition of variant epitopes by studying epitopes restricted by a multitude of HLA alleles in a diverse population infected with various HIV-1 subtypes. Our study provides further insight into the determinants of TCR cross-recognition of epitope variants and indicates that the promiscuity of HIV-1–specific T cells is highly restricted in recognition of variant epitopes. In summary, our work demonstrates that interdisciplinary methods are very useful for the study and understanding of the complex patterns of immune response data and viral evolution needed for future vaccine development, particularly as they provide an extra dimension by predicting the patterns of immune responses postinduction of escape mutations. We thank the study subjects for their participation. We thank Dr. Ann Atlas for assistance with the ethical application and sample collection for this study, Kajsa Apéria and Afsaneh Heidarian for help with sample preparation, Dr. Ma Luo and Chris Czarnecki at the Department of Medical Microbiology, University of Manitoba (Winnipeg, Manitoba, Canada), for help with the high-resolution HLA typing, and Dr. Can Kesmir for valuable comments on the manuscript. This work was supported by grants from the Swedish Agency for International Development Cooperation-SIDA (2005-001756), the Swedish Research Council (K2007-56X-20345-01-3), the Swedish Physicians against AIDS Research Foundation, Karolinska Institute, the Clas Groschinskys Memorial Fund, the Foundation of the National Board of Health and Welfare, and by the National Institutes of Health (HHSN266200400083C). The sequences presented in this article have been submitted to GenBank under accession numbers GU324779–GU324805, GU324806–GU324833, GU324834–GU324859, GU324860–GU324886, and GU324887–GU324915.
. 1994. Virus-specific CD8+ cytotoxic T-lymphocyte activity associated with control of viremia in primary human immunodeficiency virus type 1 infection. J. Virol. 68: 6103–6110.
. 1994. Temporal association of cellular immune responses with the initial control of viremia in primary human immunodeficiency virus type 1 syndrome. J. Virol. 68: 4650–4655.
. 1997. Antiviral pressure exerted by HIV-1–specific cytotoxic T lymphocytes (CTLs) during primary infection demonstrated by rapid selection of CTL escape virus. Nat. Med. 3: 205–211.
. 1997. Late escape from an immunodominant cytotoxic T-lymphocyte response associated with progression to AIDS. Nat. Med. 3: 212–217.
. 1998. Quantitation of HIV-1–specific cytotoxic T lymphocytes and plasma load of viral RNA. Science 279: 2103–2106.
. 2001. Substantial differences in specificity of HIV-specific cytotoxic T cells in acute and chronic HIV infection. J. Exp. Med. 193: 181–194.
. 2005. AIDS restriction HLA allotypes target distinct intervals of HIV-1 pathogenesis. Nat. Med. 11: 1290–1292.
. 2007. Sequential broadening of CTL responses in early HIV-1 infection is associated with viral escape. PLoS One 2: e225.
. 2009. Kinetics of expansion of epitope-specific T cell responses during primary HIV-1 infection. J. Immunol. 182: 7131–7145.
. 2001. Immune control of HIV: the obstacles of HLA and viral diversity. Nat. Immunol. 2: 473–475.
. 2002. Diversity considerations in HIV-1 vaccine selection. Science 296: 2354–2360.
. 2008. Impact of MHC class I diversity on immune control of immunodeficiency virus replication. Nat. Rev. Immunol. 8: 619–630.
. 2001. The flexibility of the TCR allows recognition of a large set of naturally occurring epitope variants by HIV-specific cytotoxic T lymphocytes. Int. Immunol. 13: 941–950.
. 2004. Recognition of variant HIV-1 epitopes from diverse viral subtypes by vaccine-induced CTL. J. Immunol. 173: 1941–1950.
. 2005. High degree of inter-clade cross-reactivity of HIV-1–specific T cell responses at the single peptide level. AIDS 19: 1449–1456.
. 2009. Minor viral and host genetic polymorphisms can dramatically impact the biologic outcome of an epitope-specific CD8 T cell response. Blood 114: 1553–1562.
. 2006. Conflicting selective forces affect T cell receptor contacts in an immunodominant human immunodeficiency virus epitope. Nat. Immunol. 7: 179–189.
. 2005. The majority of currently circulating human immunodeficiency virus type 1 clade B viruses fail to prime cytotoxic T-lymphocyte responses against an otherwise immunodominant HLA-A2-restricted epitope: implications for vaccine design. J. Virol. 79: 5000–5005.
. 2007. Altering effects of antigenic variations in HIV-1 on antiviral effectiveness of HIV-specific CTLs. J. Immunol. 178: 5513–5523.
. 2006. HIV-1 epitope-specific CD8+ T cell responses strongly associated with delayed disease progression cross-recognize epitope variants efficiently. J. Immunol. 176: 6130–6146.
. 2006. T cell receptor cross-recognition of an HIV-1 CD8+ T cell epitope presented by closely related alleles from the HLA-A3 superfamily. Int. Immunol. 18: 1179–1188.
. 2008. Broadly immunogenic HLA class I supertype-restricted elite CTL epitopes recognized in a diverse population infected with different HIV-1 subtypes. J. Immunol. 180: 5092–5100.
. 2009. NetMHCpan, a method for MHC class I binding prediction beyond humans. Immunogenetics 61: 1–13.
. 2007. NetMHCpan, a method for quantitative predictions of peptide binding to any HLA-A and -B locus protein of known sequence. PLoS One 2: e796.
. 2009. Pan-specific MHC class I predictors: a benchmark of HLA class I pan-specific prediction methods. Bioinformatics 25: 83–89.
. 2003. New allele frequency database: www.allelefrequencies.net. Tissue Antigens 61: 403–407.
. 2008. Amino acid similarity accounts for T cell cross-reactivity and for “holes” in the T cell repertoire. PLoS One 3: e1831.
. 1992. Amino acid substitution matrices from protein blocks. Proc. Natl. Acad. Sci. USA 89: 10915–10919.
. 1999. Immunodominance in major histocompatibility complex class I-restricted T lymphocyte responses. Annu. Rev. Immunol. 17: 51–88.
. 2009. HLA-B57/B*5801 human immunodeficiency virus type 1 elite controllers select for rare gag variants associated with reduced viral replication capacity and strong cytotoxic T-lymphocyte [corrected] recognition. J. Virol. 83: 2743–2755.
. 2004. T cell cross-reactivity and conformational changes during TCR engagement. J. Exp. Med. 200: 1455–1466.
. 1996. An alphabeta T cell receptor structure at 2.5 A and its orientation in the TCR-MHC complex. Science 274: 209–219.
. 2002. The specificity of TCR/pMHC interaction. Curr. Opin. Immunol. 14: 52–65.
. 2007. Antiretroviral drug therapy alters the profile of human immunodeficiency virus type 1-specific T-cell responses and shifts the immunodominant cytotoxic T-lymphocyte response from Gag to Pol. J. Virol. 81: 11543–11548.
. 1991. Peptide selection by MHC class I molecules. Nature 350: 703–706.
. 1991. Sequence analysis of peptides bound to MHC class II molecules. Nature 353: 622–627.
. 1992. Predominant naturally processed peptides bound to HLA-DR1 are derived from MHC-related molecules and are heterogeneous in size. Nature 358: 764–768.
. 1997. Antigen presentation by MHC class II molecules: invariant chain function, protein trafficking, and the molecular basis of diverse determinant capture. Hum. Immunol. 54: 159–169. ANRS Genomic Group. 2009. Genomewide association study of an AIDS-nonprogression cohort emphasizes the role played by HLA genes (ANRS Genomewide Association Study 02). J. Infect. Dis. 199: 419–426.
. 2009. Association of HLA-C and HCP5 gene regions with the clinical course of HIV-1 infection. AIDS 23: 19–28.
. 2007. A whole-genome association study of major determinants for host control of HIV-1. Science 317: 944–947.
. 2009. HLA-C cell surface expression and control of HIV/AIDS correlate with a variant upstream of HLA-C. Nat. Genet. 41: 1290–1294.